All e-pill Multi-Alarms have Auto-Reset Timers (repeat automatically every day at the same time, no reset required). 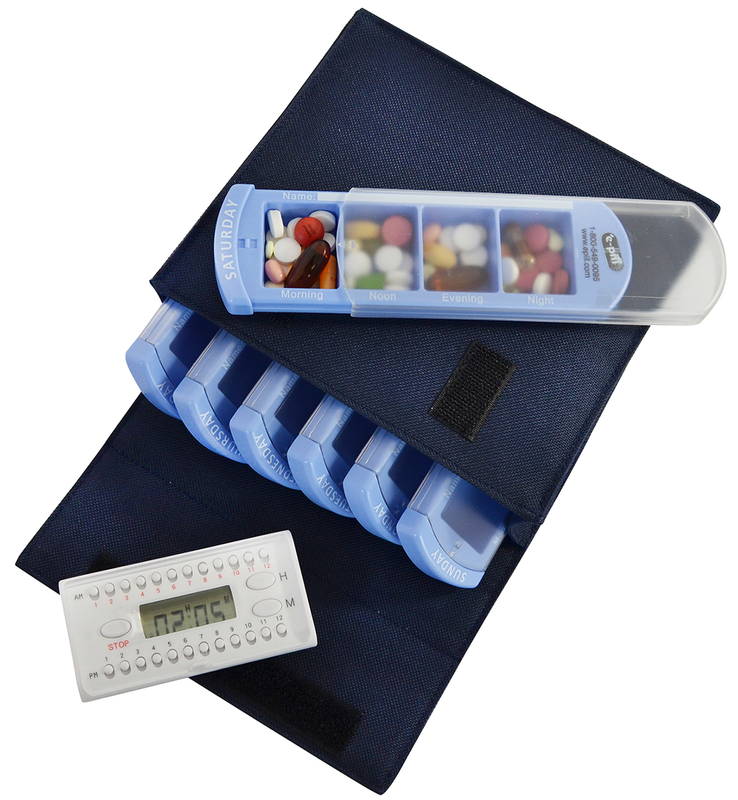 e-pill Multi-Alarm POCKET with 7 Day Pill Box Organizer (759030) - Link - up to 6 daily alarms. Easy to Set Pill Timer Pillbox with 7 daily pillboxes. Fits in your purse or briefcase. Size of Timer: 3 1/2" x 2" x 3/4". Easy to hear loud alarm. 15 second alarm duration. Color: White with Rainbow Pill Boxes. Capacity 10 aspirin sized tablets in each pillbox compartment. Pill boxes labeled Monday thru Sunday. 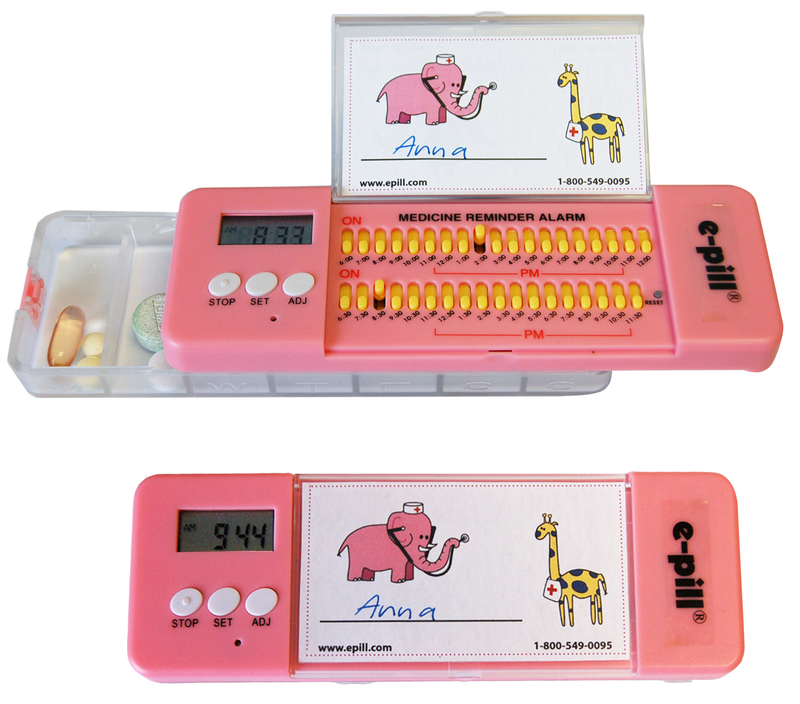 e-pill Multi-Alarm Pediatric PINK (Girl / Child / Pediatric) (759025) - Link - up to 37 daily alarms. Easy to Set Pill Timer Pillbox with large pill capacity pillbox. Easy to open slide-out pill drawer with safety lock. Size: 6 1/4" x 2 1/8" x 1". Easy to hear loud alarm. Capacity 18 aspirin sized tablets in each pillbox compartment. Pill tray labeled Monday thru Sunday. Battery life: One Year (replaceable AAA x 2). Learn about slide switch setting. 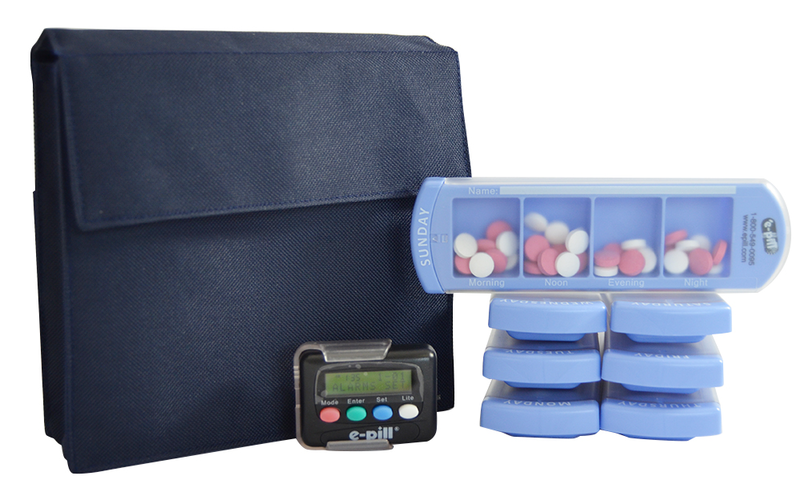 e-pill Weekly 5 Doses per Day Pill Box Organizer System with Daily Timer (941630) - Link -up to 6 daily alarms. Easy to Set Pill Timer Pillbox with 7 daily pillboxes. Each pillbox has 5 compartments. Capacity 14 aspirin sized tablets in each pillbox compartment. 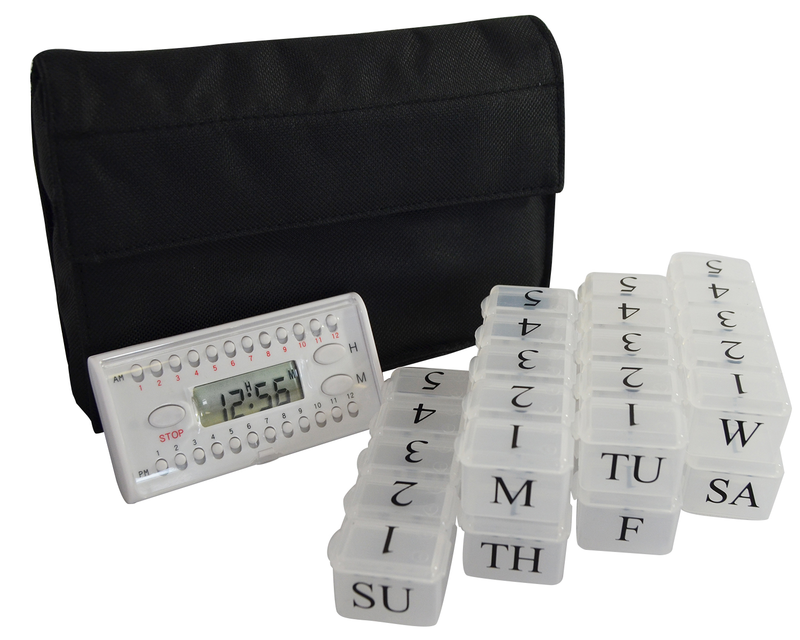 e-pill Weekly 4 Doses per Day Pill Box Organizer System with Daily Timer (960650) - Link - Now with up to 6 daily alarms. Largest capacity pill box on the market. Each compartment holds 25 aspirin-sized tablets. Each daily organizer has four (4) compartments. 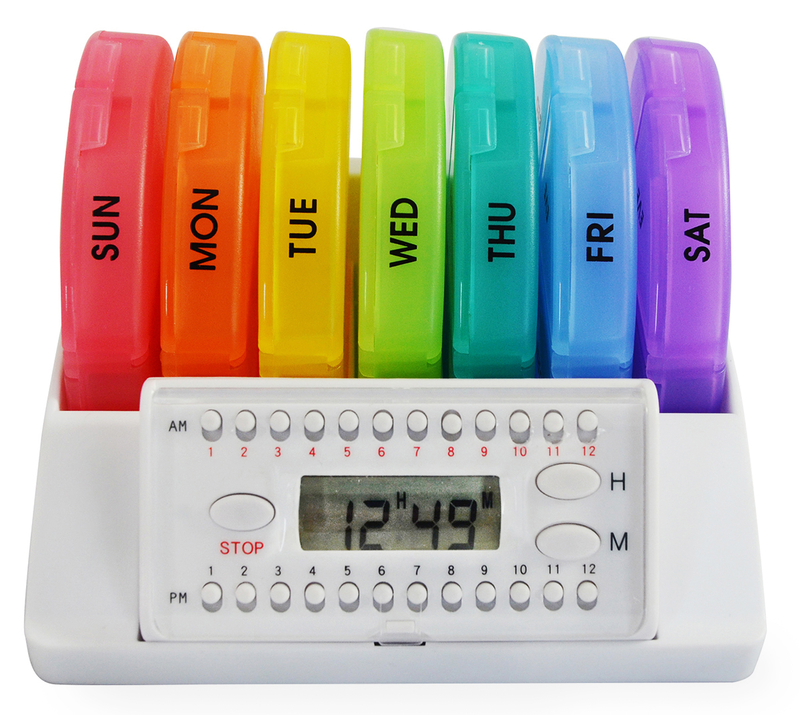 e-pill Silent 7 Day Organizer & Reminder System (960617) - Link - up to 12 daily vibrating alarms. Largest capacity pillbox on the market. Dishwasher safe daily pillboxes. Includes the e-pill Vibrating 12 Alarm Pager (Vibrating 12 Alarm Pager). Color: Blue canvas bag and Blue pillboxes. Black Pager. e-pill Multi-Alarm HOME (841649) - Link - up to 6 daily alarms. Kitchen e-pill timer with strong magnet. Fits on your refrigerator door or any magnetic surface. Set up to 6 Multiple Daily Alarms from 12 a.m. to 11 p.m. 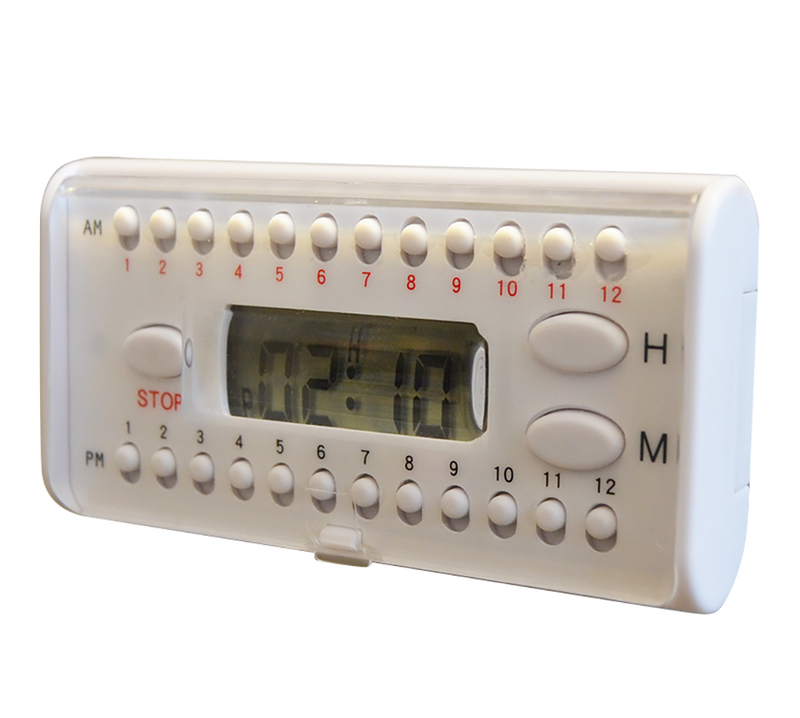 Size: 3 1/2" x 2" x 3/4"
e-pill Multi-Alarm POCKET (759842) - Link - up to 6 daily alarms. 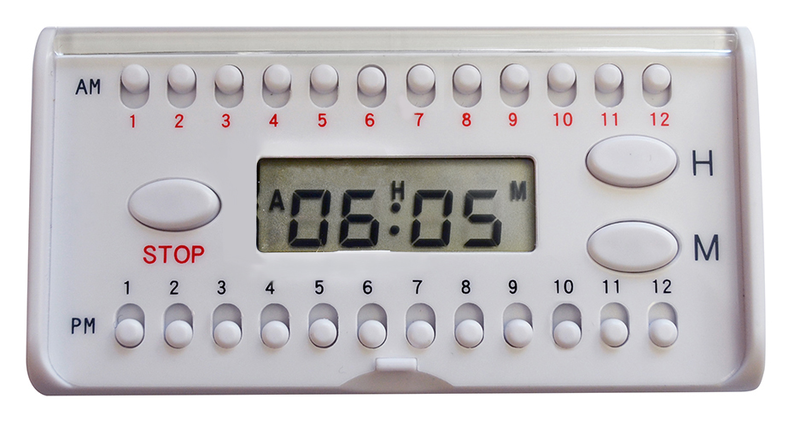 Easy to Set Pill Timer fits in your purse or briefcase. The alarms will automatically repeat every day at the same time. FREE Shipping & Handling (this offer applies to US customers only, $15.00 per order for Non-US Customers), FREE Batteries, 30-Day Money Back Guarantee and One Year Warranty on all epills.